Sea, Sand & Sky: A Sea of Smiles! 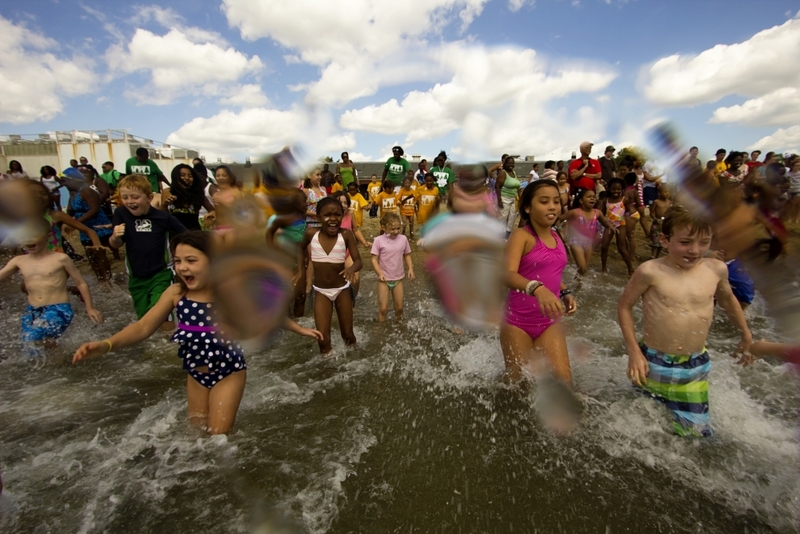 Hundreds of kids from across the city make a big splash on the beach in South Boston. 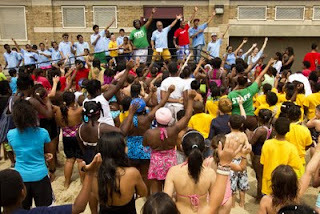 On Friday 400 youth and teens from across the City of Boston joined Save the Harbor/ Save the Bay for a day of celebration on the beach at the Curly Recreation Center at M Street, hosted by Save the Harbor's Youth Committee in partnership with the Boston Center for Youth and Families. 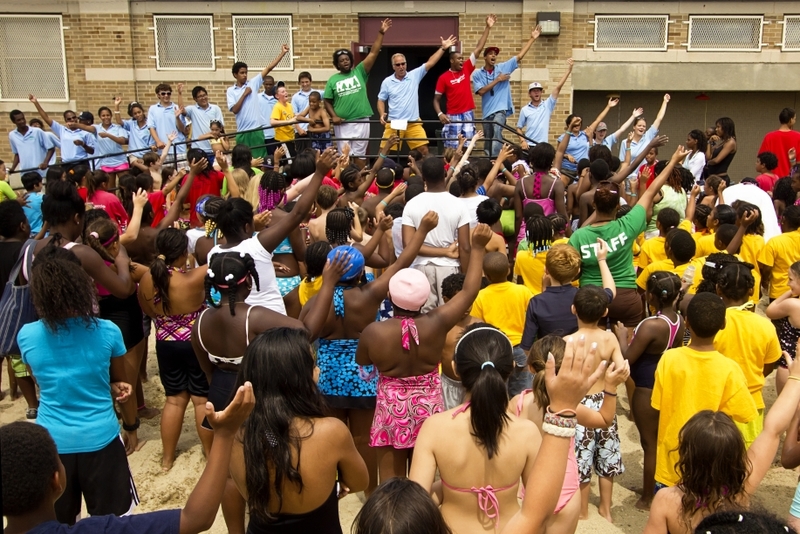 Participants at the "Blue is Back" Kids Beach Bash and Splash included Save the Harbor's youth program partners from South Boston, Dorchester, East Boston, Jamaica Plain, Chinatown, Roxbury, and Hyde Park. They spent the morning on the beach making sand castles, flying kites, and learning about crabs and lobsters from Save the Harbor's youth program staff. At noon the kids simultaneously plunged into the cool clean water of Boston Harbor to celebrate Save the Harbor / Save the Bay's 25th Anniversary - under the watchful eyes of a team of lifeguards from greater Boston YMCA's, who were on hand to make sure that the event was fun and safe for everyone. The splash was followed by a traditional cookout on the beach. "It was a sea of smiles!" said Save the Harbor's Youth Committee Co-Chair Will Clark, 19, of Boston who now attends St. John's University. 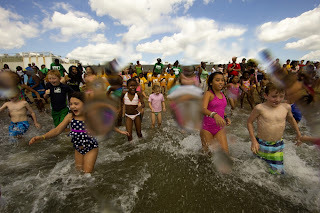 "Having some good clean fun on one of the cleanest urban beaches in America is a great way for kids to spend a summer day." Save the Harbor's Youth Committee Co-Chairs Will Clark, Conor Newman and Thi Tran join Save the Harbor's Maritime Historian David Coffin in leading the traditional Sea Chantey "Haul Away Joe"
While heavy rains earlier in the week forced numerous beach closings across the region, on Friday blue flags were flying on the beaches of South Boston and North Dorchester Bay. "In the past the South Boston beaches have been closed as often as one out of every five days in a typical year" said Save the Harbor / Save the Bay's spokesman Bruce Berman. 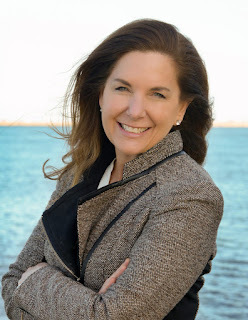 "With the completion of the South Boston project earlier this year, there have been no combined sewer or stormwater discharges whatsoever on these beaches this summer, and nearly no beach closings. Though there will still be red flags on these beaches from time to time, these beaches are now among the cleanest urban beaches in the nation. That's cause for celebration - and that's what we intend to do!" Save the Harbor's free summer youth programs are made possible by the generosity of Save the Harbor/Save the Bay’s youth program partners, Arbella Insurance Group Charitable Foundation, Inc, Forrest Berkley and Marcie Tyre Berkley, Coca Cola Foundation, Distrigas of Massachusetts, Friedman Family Foundation, John Hancock Financial Services, Inc., Massachusetts Port Authority, Massachusetts Foundation for the Humanities, Mayor Menino’s Summer Youth Employment Program, National Grid Foundation, P & G Gillette, P.I. Garden Fund, State Street Foundation and by the contributions of other corporate, and philanthropic partners and hundreds of individual donors. Save the Harbor / Save the Bay is a non-profit, public-interest environmental advocacy organization, whose mission is to restore and protect Boston Harbor, Massachusetts Bay, and the marine environment and share them with the public for everyone to enjoy. Since 2003, our free youth programs have connected more than 50,000 young people to the harbor they have worked so hard to restore and protect.